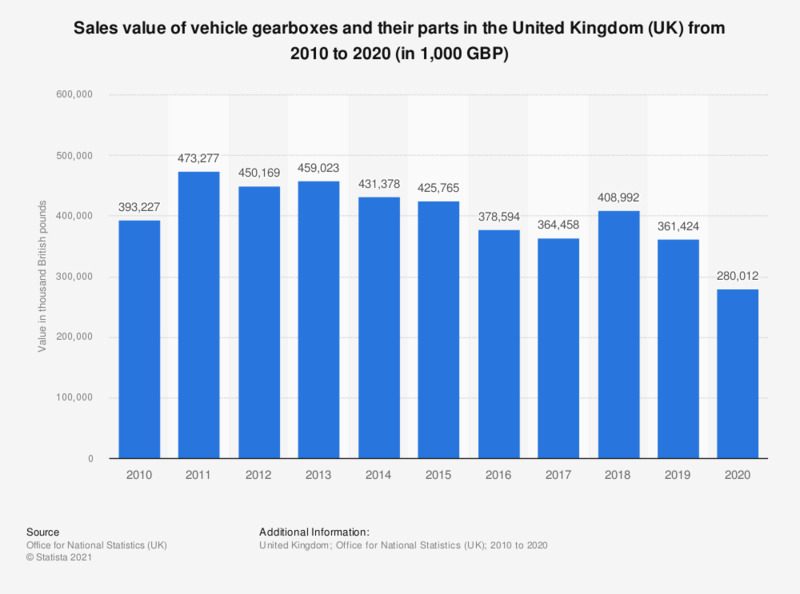 This statistic shows the sales value of gearboxes and their parts for tractors, motor cars and other motor vehicles based on PRODCOM estimates** in the United Kingdom between 2010 and 2017. The UK has experienced an overall decrease in sales value over this period. The sales value reached 366.4 million British pounds in 2017. Gearboxes and their parts for tractors, motor cars and other motor vehicles for carrying people, goods vehicles, crane lorries, fire-fighting vehicles, concrete-mixer lorries, road sweepers, spraying lorries, mobile workshops and mobile radiological units.